...combines a nylon-string flavoring with the electrical pulse of Alternative Indie Rock. Combining an acoustic sound with the electrical pulse of Indie Rock, Froomador’s unique songwriting approach leaves room for the listener’s own interpretation. 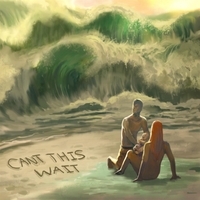 His latest album, “Can’t This Wait” includes the single “Solar Energy” for which there is a climatic music video that has been filmed in the Arizona desert, and is to be released in early 2016. Orlando native Ryan Froom credits his passion for music to his father whom he watched simultaneously play the guitar and sing at church during his early childhood. By the age of 10 he had his first guitar and was 12 years old when he wrote his first song. His father introduced him to the “The Doobie Brothers”, “Beach Boys”, and “The Beatles” during his early teens in which Ryan also began to sensationalize the sport of surfing. Heavily influenced by the beachy tunes, Ryan acquired a palate for the soothing sounds of the ukulele, and began to incorporate them into his songs. During his early high school days, he recalls sneaking into his older brother’s melancholy record collection and discovering the sound of “The Cure”, “The Smiths”, and “Nirvana”. It was then that Ryan also began to incorporate the electric guitar into his songwriting sessions. At the age of 23, Ryan moved to Argentina and would spend the next eight months learning Spanish and being surrounded by Latin Jazz and Flamenco. By the age of 24, he lived a few months in Brazil where he would also learn to speak Portuguese and develop an interest in Brazilian samba and the sassy Latin tunes, inspiring him to write and record his album “Pavement Ends” several years later. In 2009, he enrolled in the prestigious school of music “Berklee” in Boston where he would focus on Jazz Composition and classical arrangements for the next year and a half. Froomador has performed live in several cities including Hollywood and Claremont, CA, Washington D.C., and countless venues in his hometown Orlando, FL, where he currently resides.